New Delhi(web team): ON Friday, PM Narendra Modi delivered his maiden speech at the UNESCO in Paris. 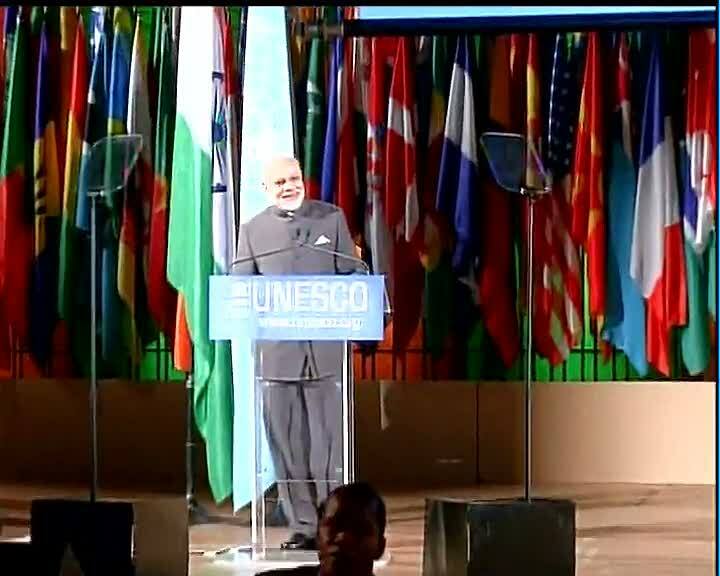 Speaking at UNESCO, PM Modi said he felt honoured and privileged to have been a part of the organisation's 70th anniversary. He also appreciated UNESCO's initiatives to preserve the cultural heritage across the world, and especially India. The PM said because of the United Nations, the world remains to be a better place. PM Modi also said, "Our collective goal is to seek a peaceful and prosperous future for our world in which every nation has a voice." The PM also acknowledged and thanked UNESCO's contribution and support to promote education and science in India. Speaking on unity, PM Modi said, "Culture must connect, not divide, our world." Prime Minister Narendra Modi, who is currently on the first leg of his three nation nine-day tour, was accorded a ceremonial welcome at the Élysée Palace in Paris on Friday. The national anthems of both countries were played before the French army accorded him the guard of honour.